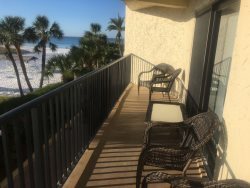 Great 2BR/2BA with wonderful Gulf Views from living room, master bedroom and large balcony! Completely remodeled in Fall of 2016 with everything new! Stainless appliances, bright decor, ceiling fans and flat screen TV's in all rooms! King in master, 2 Queens in guest room and sofa sleeper in living room. Beautiful tiled floors throughout with walk-in showers in each bath! Washer and Dryer in the unit. Parking space #33. Everyone we spoke to was very friendly, polite and helpful. We had to reschedule our vacation from September 2017 to May 2018 due to the hurricane and the ladies in the office made the process seamless. Best team ever! This was our first visit to Siesta Key and we will be back to stay at El Presidente in the future!